Green Papaya – Go There. Try That. 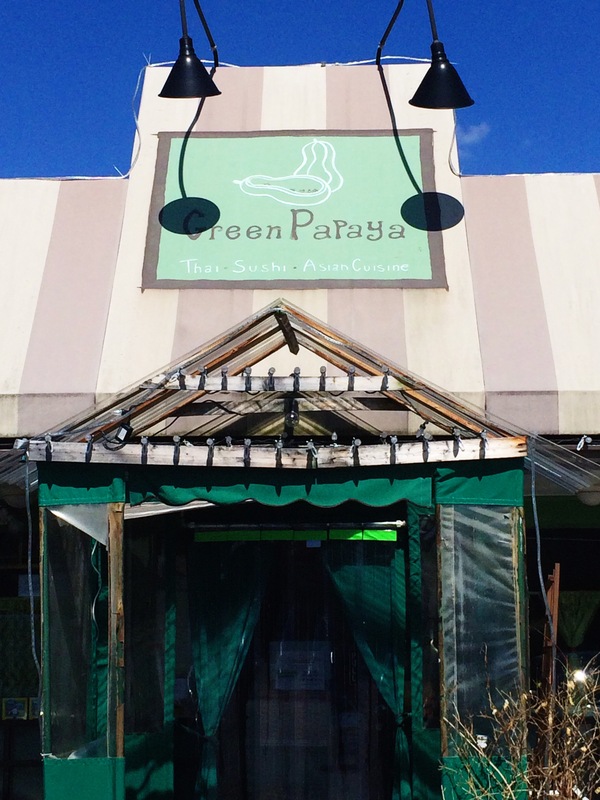 Today is a quick post highlighting Green Papaya, one of my favorite Thai places. Honestly, I could eat Thai food all the time because I love the herbs and spices that are infused in the food, and Green Papaya is my go to for Thai. Plus, Green Papaya is locally owned and I love to support local businesses. We eat dinner there quite a bit, but what I discovered recently, is how good it is for lunch! 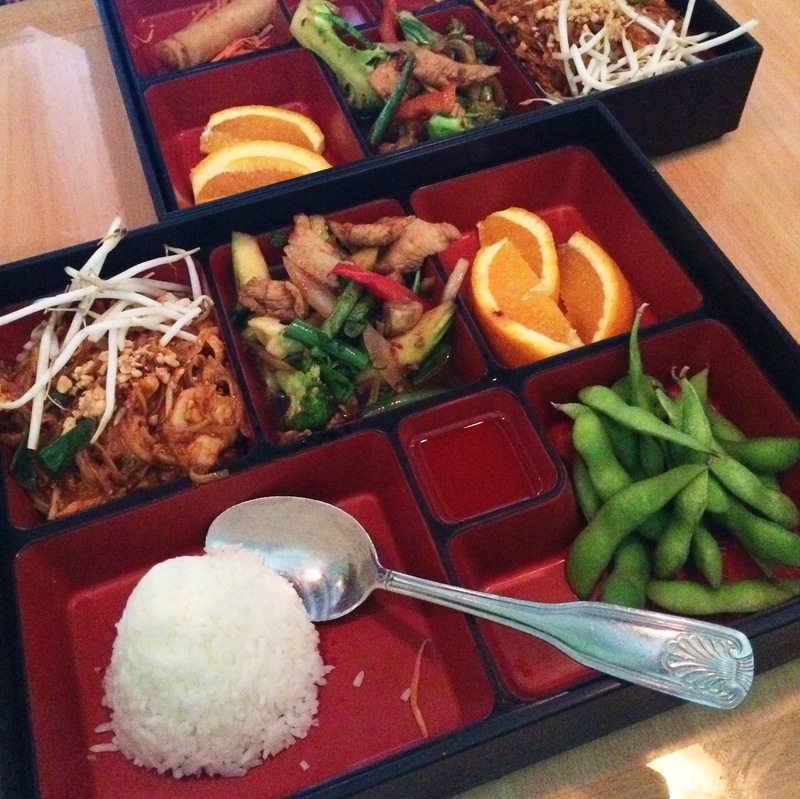 If you’re trying to avoid fast food, and want something full of flavor, I suggest trying the Bento Boxes at Green Papaya. These are perfect because you get several small courses without paying a fortune. A Bento Box is a single portion meal in a box. Traditional Bento Boxes serve rice, fish or meat, and vegetables. At Green Papaya, you have two choices in lunch boxes. Option 1 includes soup, an appetizer, fruit, and two rice or noodle dishes. Option 2 comes with soup, appetizer, fruit, and two sushi choices. 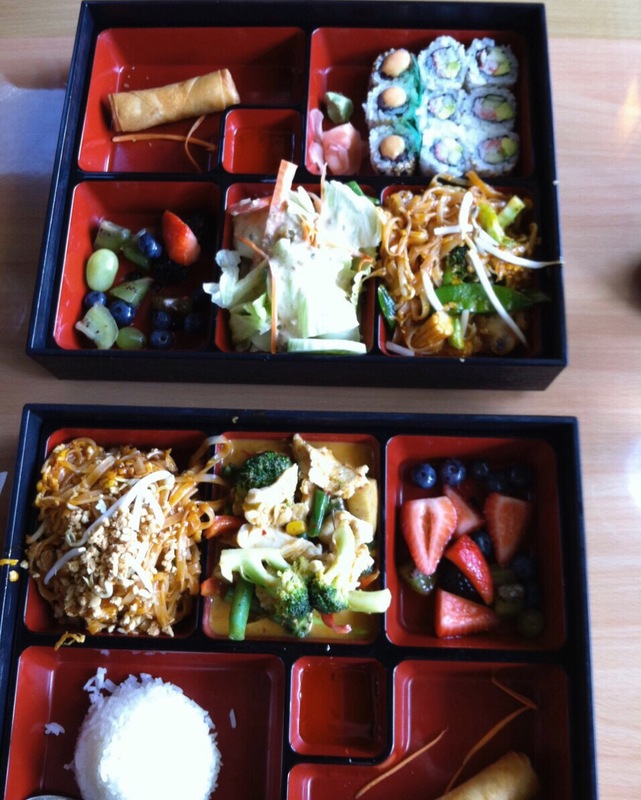 It’s a perfect lunch portion… and did I mention it’s served in a super cool box? It’s the little things people! If you stop in for dinner, the Stir Fry with Basil is divine. It’s fresh and aromatic! If you like noodle dishes, this is my favorite place for Chicken Pad Thai and Pork Pad See Ew! If you’re feeling sushi, try the Green Papaya roll. This one has shrimp tempura, spicy tuna, crab stick, mango, spicy mayo, and tempura flakes. Awesome taste and texture. I also have an obsession with hot and sour soup. Seriously. If I’m sick, no chicken noodle for this girl. At Green Papaya it’s called Tom Yum. This version has lemon grass, mushrooms, and lime juice. This hot and sour is so interesting. I’m going to bring out my “hey, I watch Top Chef” voice and say that the broth is complex and layered with flavor. Green Papaya is located in Hyde Park off Wasson. The parking lot is small so you might need to park on the side street. Enjoy! GO THERE (Green Papaya)! TRY THAT(Bento Box)! I love the Thai basil dish! So good! The bento boxes look so cute! I’ll have to go there for lunch.